Here’s a radio interview I did at the ungodly hour of 7:15 today with the charming Don Connolly of CBC’s Information Morning. I’m babbling a bit but hopefully you’ll be able to glean a little insight into the making of Being 18. 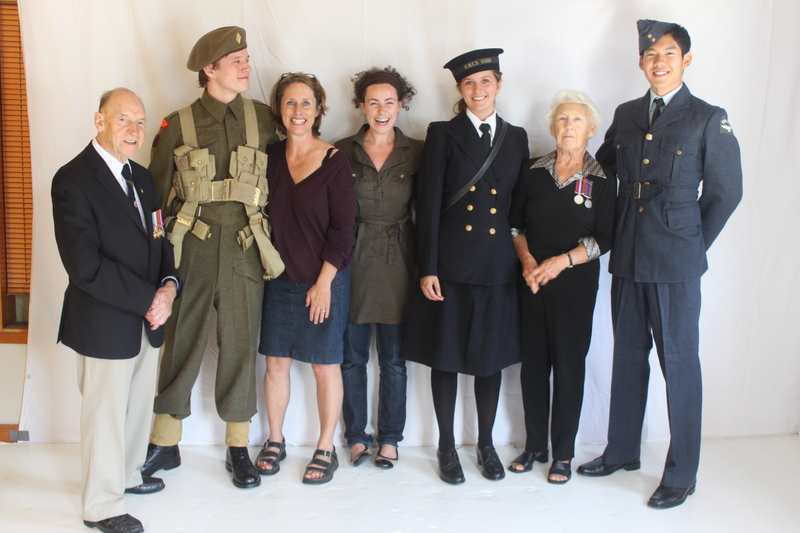 Left to right: Angus McDonald, my nephew George Button, Yours Truly, Jasmine Oore, my daughter Jeannie Richardson, Jean Lloy and Josh Kim. Also featured were my bedsheets, playing a starring role as the backdrop. P.S. too – George and Jeannie are wearing the same uniforms their grandparents would have worn at that age. P.P.S. Angus McDonald was in the Merchant Navy. Jean Lloy was a WREN, stationed in Halifax. P.P.P.S. Another nephew of mine, Charlie Grant of The Band Before Time, wrote the music. Your video is wonderful. I saw it a couple of days ago and found it very moving. I didn’t know that you were behind it and am delighted to know that it was produced by a Haligonian. Bravo. Thank you, Mary Lou! I really enjoyed doing it. It was wonderful meeting the vets and the response has been very gratifying.